An experimental medical device called the Harpoon TSD-5 is proving its worth in clinical trials, repairing heart valves with perfect success—and without the need to perform open-heart surgery. 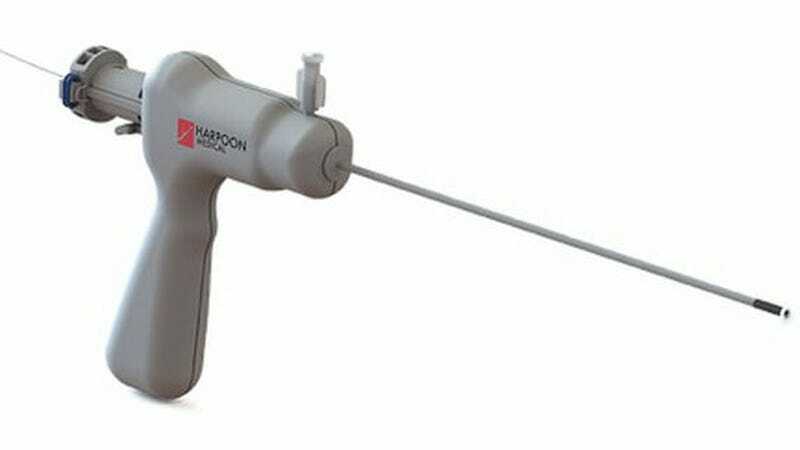 It looks like some sort of torture device, but the Harpoon TSD-5 has the potential to dramatically decrease the need for invasive open heart surgeries to repair mitral valves. In a clinical trial involving 11 patients at a hospital in Poland, the experimental device performed with 100 percent procedural success, treating degenerative mitral regurgitation (MR), the most common type of heart valve disorder. Developed by Harpoon Medical and the University of Maryland Medical Center, the device isn’t yet available for commercial use, but the new test results, which appear in Circulation, are encouraging. In MR, a leaky valve results in blood traveling in the wrong direction, causing irregular heartbeats and other serious complications. It happens when the small fibrous cords that open and close the valve’s flaps are broken or stretched. Normally, mitral valve repair is performed during open-heart surgery, a lengthy and invasive operation in which the patient’s chest has been opened, the heart stopped, and circulation maintained by a heart-lung bypass machine. Recovery typically takes months. The TSD-5 works by anchoring artificial cords onto the flaps to replace the defective, natural cords. During surgery, the device is guided to the surface of the defective mitral flap. Once the surgeon has located the optimal spot for an artificial cord, a specially designed needle wrapped with 50 coils of a special polymer makes a tiny hole and sends the cord material through the flap. An automated process then creates a knot to hold the cord in place. The other end of the flap is adjusted for length and bound to the outside layer of the heart. MR affects about two percent of the population, and the developers estimate that the Harpoon will be applicable to about three-quarters of patients with the degenerative disease. With this preliminary phase of the trial complete, the next step will be to expand the study to include more patients, and with varying levels of MR severity.